NASA's most advanced planetary rover, the 1-ton Curiosity , the centerpiece of the Mars Science Laboratory (MSL) mission, is slated to land at the Gale Crater on the night of Aug. 5 to look for chemical evidence of ancient life preserved within exposures near the base of a five-kilometers high mound of layered materials at the center of Gale crater (above). However, getting the Curiosity rover to the surface of Mars will be a hair-raising event –that has been nicknamed the "seven minutes of terror." "The Curiosity landing is the hardest NASA mission ever attempted in the history of robotic planetary exploration," said John Grunsfeld, associate administrator for NASA's Science Mission Directorate, at NASA Headquarters in Washington. "While the challenge is great, the team's skill and determination give me high confidence in a successful landing." To achieve the precision needed for landing (see diagram at bottom of page) safely inside Gale Crater, the spacecraft will fly like a wing in the upper atmosphere instead of dropping like a rock. To land the 1-ton rover, an airbag method used on previous Mars rovers will not work. Mission engineers at NASA's Jet Propulsion Laboratory in Pasadena, Calif., designed a "sky crane" method for the final several seconds of the flight. A backpack with retro-rockets controlling descent speed will lower the rover on three nylon cords just before touchdown. 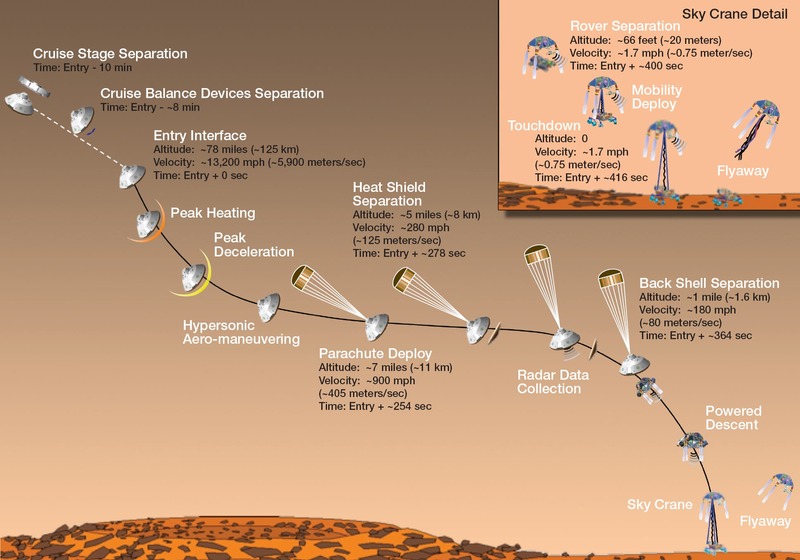 During a critical period lasting only about seven minutes, the Mars Science Laboratory spacecraft carrying Curiosity must decelerate from about 13,200 mph (about 5,900 meters per second) to allow the rover to land on the surface at about 1.7 mph (three-fourths of a meter per second). Curiosity is scheduled to land at approximately 10:31 p.m. PDT on Aug. 5 (1:31 a.m. EDT on Aug. 6). "Those seven minutes are the most challenging part of this entire mission," said Pete Theisinger, the mission's project manager at JPL. "For the landing to succeed, hundreds of events will need to go right, many with split-second timing and all controlled autonomously by the spacecraft. We've done all we can think of to succeed. We expect to get Curiosity safely onto the ground, but there is no guarantee. The risks are real." In early June, a NASA spacecraft in orbit around the Red Planet, called Mars Odyssey, suffered a malfunction on one of its reaction wheels, an instrument that helps control the probe's attitude in space. * "Odyssey looks like it may not be where we expect it to be," said Doug McCuistion, director of the Mars Exploration Program at NASA Headquarters. The glitch does not pose a risk to Curiosity's impending arrival at the Red Planet, officials said. But Mars Odyssey's original orbit would have given it a complete view of Curiosity's landing, so the probe had been pegged to act as an orbiting outpost to relay communications and data back to mission managers on Earth. With Odyssey in the picture, mission managers may be able to confirm Curiosity's touchdown by 10:31 p.m. PDT on Aug. 5 (1:31 a.m. EDT Aug. 6). Without Odyssey, however, mission controllers may not know the outcome of the landing maneuver until 10:35 p.m. PDT or later. During the initial weeks after the actual landing, JPL mission controllers will put the rover through a series of checkouts and activities to characterize its performance on Mars, while gradually ramping up scientific investigations. Curiosity then will begin investigating whether an area with a wet history inside Mars' Gale Crater ever has offered an environment favorable for microbial life. "Earlier missions have found that ancient Mars had wet environments," said Michael Meyer, lead scientist for NASA's Mars Program at NASA Headquarters. "Curiosity takes us the next logical step in understanding the potential for life on Mars." Curiosity will use tools on a robotic arm to deliver samples from Martian rocks and soils into laboratory instruments inside the rover that can reveal chemical and mineral composition. A laser instrument will use its beam to induce a spark on a target and read the spark's spectrum of light to identify chemical elements in the target. Other instruments on the car-sized rover will examine the surrounding environment from a distance or by direct touch with the arm. The rover will check for the basic chemical ingredients for life and for evidence about energy available for life. It also will assess factors that could be hazardous for life, such as the radiation environment. "For its ambitious goals, this mission needs a great landing site and a big payload," said McCuistion. "During the descent through the atmosphere, the mission will rely on bold techniques enabling use of a smaller target area and a heavier robot on the ground than were possible for any previous Mars mission. Those techniques also advance us toward human-crew Mars missions, which will need even more precise targeting and heavier landers." The chosen landing site is beside a mountain informally called Mount Sharp. The mission's prime destination lies on the slope of the mountain. Driving there from the landing site may take many months. Because of its history, 96-mile wide Gale Crater crater with its strangely sculpted mountain –three times higher than the Grand Canyon is deep–is the ideal place for Curiosity to conduct its mission of exploration into the Red Planet's past. 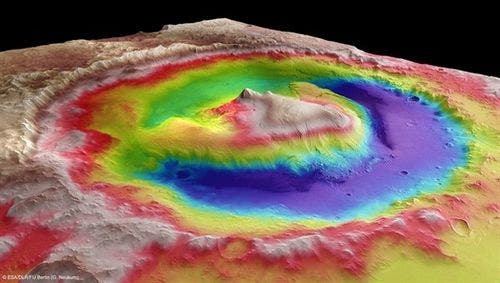 Researchers plan to use Curiosity to study layers in the mountain that hold evidence about wet environments of early Mars. "This may be one of the thickest exposed sections of layered sedimentary rocks in the solar system," said Joy Crisp, MSL Deputy Project Scientist from NASA's Jet Propulsion Laboratory. "The rock record preserved in those layers holds stories that are billions of years old — stories about whether, when, and for how long Mars might have been habitable." An instrument on Curiosity can check for any water that might be bound into shallow underground minerals along the rover's path. Today the Red Planet is a radiation-drenched, bitterly cold, bleak world. Enormous dust storms explode across the barren landscape and darken Martian skies for months at a time. But data from the Mars Reconnaissance Orbiter suggest that Mars once hosted vast lakes and flowing rivers. "Gale Crater and its mountain will tell this intriguing story," says Matthew Golombek, Mars Exploration Program Landing Site Scientist from JPL. "The layers there chronicle Mars' environmental history." "Be patient about the drive. It will be well worth the wait and we are apt to find some targets of interest on the way," said John Grotzinger, MSL project scientist at the California Institute of Technology in Pasadena. "When we get to the lower layers in Mount Sharp, we'll read them like chapters in a book about changing environmental conditions when Mars was wetter than it is today."